There’s nothing like chocolate to make an event special, and Kupu-Kupu knows how to use chocolate to make Valentine’s an ultra special time. Spa Kupu-Kupu, located in the Sun Marina Hotel, is offering a delectable combination of chocolates for both the body and spirit during a special running through the end of this month. Kupu-Kupu has designed an Esthetic Chocolate Spa combined with a dinner. For starters, enjoy a foot bath, chocolate scrub and a chocolate pack treatment, followed by an aroma body massage. To cap the evening, enjoy a special dinner that is included in the rprice at Sun Marina Hotel’s ‘By the Sea’ restaurant. 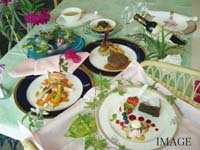 The dinner includes an appetizer, soup, seven various dishes and either a fish or beef filet cutlet Milan style. Dessert made sight in front of guests, coffee or freshly picked tea. While soaking up the pampered treatment at Spa Kupu-Kupu, thereﾕs a special mist sauna and Jacuzzi rooms, as well as a variety of British-made Neilﾕs Yard top-of-the-line, and American all-natural organic Young Living aroma oils, plus all natural Okinawa ingredients for facial packs. Sun Marina Hotel Spa Kupu-Kupu is open daily 11 a.m. ~ 10 p.m. Reservations are available at (090) 9788-7156, or (098) 965-2383. The Sun Marina Hotel is located on Highway 58, between Moon Beach and Rizzan Seapark Hotels.